Falling In Reverse continues to champion the outsider, the cast aside, the underestimated, making music to empower and inspire life's underdogs. Why See Falling In Reverse? The tour kicks of in the band's hometown of Las Vegas and will take them across the country before stopping for the last show in Los Angeles. 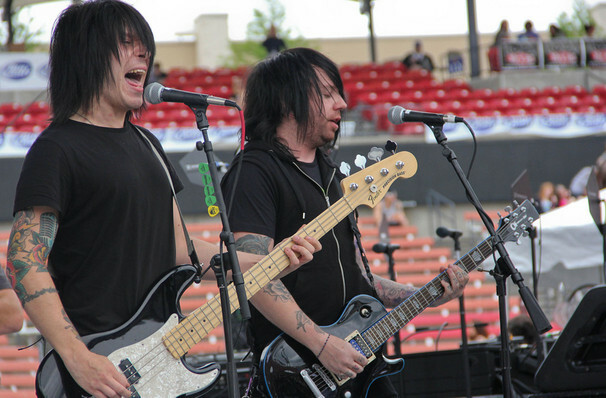 The bands debut album 'The Drug in Me Is You' was released in 2011 and sold 18,000 copies in its first week. Their latest album 'Coming Home' came out in 2017 and was said to comprise of "pretty synths hovering over the top of the crunchy, loud guitars" by Sputnik Music. The tour will see metalcore band Ice Nine Kills, Pennsylvania rock band From Ashes to New and Californian native rockers New Years Day perform alongside Falling In Reverse. Seen Falling In Reverse? Loved it? Hated it? Sound good to you? 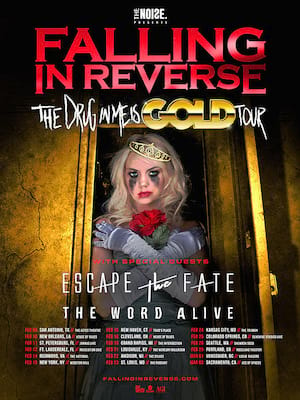 Share this page on social media and let your friends know about Falling In Reverse at Ogden Theater. Please note: The term Ogden Theater and/or Falling In Reverse as well as all associated graphics, logos, and/or other trademarks, tradenames or copyrights are the property of the Ogden Theater and/or Falling In Reverse and are used herein for factual descriptive purposes only. We are in no way associated with or authorized by the Ogden Theater and/or Falling In Reverse and neither that entity nor any of its affiliates have licensed or endorsed us to sell tickets, goods and or services in conjunction with their events.